Where Trench Shields protect workers from harm when a cave-in occurs, hydraulic shoring products are designed to actually prevent the cave-in from happening! The GME Hydraulic Shoring Products range from; Vertical Shores, End Shores, Hydraulic Shields, Walers Systems and Manhole Shoring. Excellent for use in areas with crossing utilities, spot repairs, tight situations, and sites that a larger machine just can’t get too. All of the Hydraulic Shoring Products are designed to be used machines no bigger than rubber tired backhoe or mini-excavators. GME Hydraulic Vertical Shores are designed to prevent cave-ins, by supporting the side walls of the trench through the use of hydraulic pressure. They are quick, safe and simple to use. 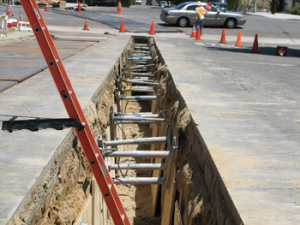 Vertical shores are designed to be installed and removed 100% from the top of the trench; and can be used as spot bracing for repair situations, or can be used for production trenching. The GME Endshore is designed as a way to close off an end of an excavation. Able to be paired with hydraulic shoring or trench shields, the GME End Shore is versatile system. GME Hydraulic Trench Shields consist of lightweight, aluminum sidewalls, coupled with heavy-duty hydraulic struts. The strut contains a hydraulic cylinder and return spring, and is protected by steel box tubing. Because of their light weight and easy assembly, these trench boxes can be handled easily by rubber-tired backhoes. They are ideal for municipal maintenance or repair projects, utility or cable work, and light to moderate duty general underground contracting. GME Waler Systems are designed to allow maximum protection, coupled with the versatility and flexibility needed to work around crossing utility lines. Two styles of walers are available. Walers with hydraulic struts allow end-loading in a 3- or 4-sided application, for pipe repair or valve maintenance. Walers with hydraulic cylinders are designed to be used in a 2 - sided application for production work. Waler systems, used in conjunction with proper sheeting materials, can prove to be a versatile and sure style of shoring protection. GME Manhole Shores are designed to shore square or rectangular excavations. They provide 4-way hydraulic support against the trench walls to create an obstruction - free pit which permits adequate working room for the installation of manholes or vaults, or the operation of boring equipment. GME Manhole Shores are easily transported as four individual cylinder and tube sections, and quickly assemble at the job site.